The House by Northwestern team’s entry, targeted to Baby Boomers living on Chicago’s North Shore, won first place for market potential, first place for communications and third place for engineering. 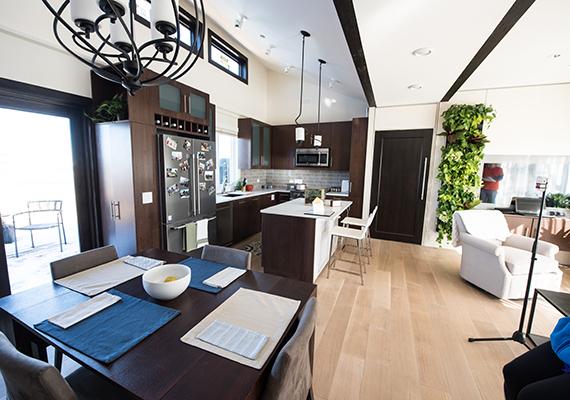 Kitchen and dining area of the Northwestern team’s Enable competition house in Denver. Photo by Dennis Schroeder/U.S. Department of Energy Solar Decathlon. The teams were judged in 10 different contests that scored everything from energy efficiency and architectural design to comfort and communications. The House by Northwestern team’s entry, targeted to Baby Boomers living on Chicago’s North Shore, won first place for market potential, first place for communications and third place for engineering. It was also voted “Super Awesome House” by the middle school students of Colorado. 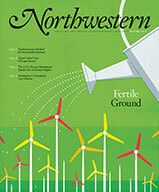 Northwestern finished sixth overall in the 11-team competition. The Swiss team, representing four institutions, finished first. Proving Enable’s market potential, Evanston resident Jerry Brennan is purchasing the solar-powered house, which he’ll place on his lot in north Evanston and open occasionally to Northwestern educational programs. Financial support from the University, corporate sponsors and other donors made the finished product possible.